NUMBERS GAME – If your house numbers are dated, consider changing them out or giving them an update. The hardware store has many options with several finishes that can add personality and an updated feel to a dated porch. Another alternative is to remove them and spray paint them black or white (especially if they are brass!) Be sure to use metal paint if painting metal numbers and clean and prep the surface before painting. Also, if the numbers are mounted on a painted surface, be sure that whatever you replace them with will not leave unpainted or mismatched color spots if they are sized differently than the old numbers. QUICK (ISH) PAINTING– Look at the exterior of your house and see which small items could be refreshed without a whole lot of trouble. Consider a spruce to shutters or doors with paint—it’s fairly cheap and fast and can totally change the look of the house. You may even consider painting the door a fun accent color! FANCIFY THE DOOR – Since you might already be painting it anyway, check out your door’s hardware. Have the knobs and locks seen better days? If so, before painting is a great time to change it out. Remove the old hardware, prep and paint the door and then install the new hardware. That way, you won’t have to fret about any unpainted spots where the old hardware used to be–plus you’ll have a modernized entry to enjoy every time you open the door. You use the door and door handle every day, you might as well love it! FLOWERS ARE ALWAYS IN STYLE– Of course, if we are going to talk about curb appeal, I’d be remiss not to mention landscaping! Add in some flowering shrubs such as azaleas or camellias to add a new dimension of texture and color. You can also (or instead of) add annual blooms to your beds or a few well-placed planters filled with brightly colored plants for instant pop! Flowers will not only bump up your curb appeal, but will lift your mood too! The plants are relatively inexpensive and the personal enjoyment is free with purchase! MAILBOX MAKEOVER –If it’s rusty, full of dents, or just plain ugly, it may be time for a new mailbox. It doesn’t have to cost a fortune, it just needs to be clean and functional. YARD CLEAN UP – The best part of this is that it is FREE! Yay! 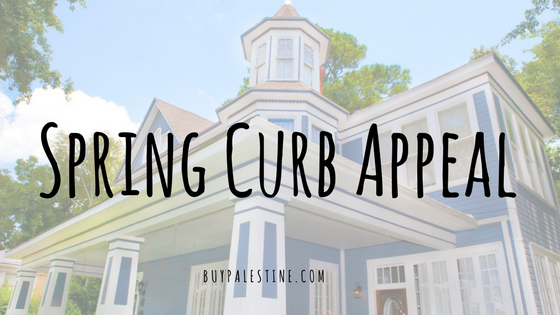 One of the fastest ways to boost your curb appeal is to take the “less is more approach.” This is made easier if you live in town by getting a free junk pass for the dump from the city. Get rid of the sun-bleached, broken or unwanted items in the yard. Take a look at your yard and porch—are there random items that don’t belong? Find new storage locations for the assorted hoses, garden tools and clutter. If its trash, get rid of it. Finish off with a good mowing and sweeping and then have a glass of well-deserved lemonade while enjoying the cleaned up yard! Giving your curb appeal a boost doesn’t have to cost a fortune or take an eternity. If you are looking for a change, curb appeal is a great place to start this spring. Big changes or small changes, they all add up to show of your house at its absolute best. Lisa Priest has recently taken up gardening and is a Broker/REALTOR® with Picket Fence Realty, Inc. You can reach her via phone or text at 903-948-3343 or read more at BuyPalestine.com.